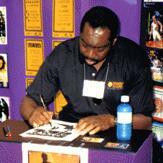 Basketball legend Earl Monroe signs autographs from the IBA booth at the NSGA Show in Chicago. As the IBA moves towards its inaugural season, information telephone lines have been set up to service inquiries regarding franchising and merchandise properties. The league overview presents the league, and its philosophy, and how it will make live, pro basketball exciting, fun, ... and affordable again! Read all about it! The IBA is coming to town! Above the Rim is the IBA's monthly newsletter that brings to you all of the happenings in the League. From first press conference, to opening night, the schedule to tip-off lays out the events. The game, as defined by the IBA's game rules, will allow for greater defensive strategies, and more continuous action. The league officials are a group of experienced professionals, both in business and sports management, well suited to organizing and operating a major sports enterprise, including several high-profile professional basketball names. Teams are being awarded franchises in locales throughout North America, and are scheduled to tip-off in the inaugural season of the IBA. The players of the International Basketball League are committed to the game and their communities. The fans of the International Basketball League tell it like it is, as they query and comment on IBA happenings. ibaslam.com looks best when viewed in Web browsers that support tables. Copyright 1996 International Basketball Association, Inc.